The adventures of The Bear, Ralph, Shipley and Roscoe continue in this heart-felt novel about the close bond a man has with his cats. So much so, the cats have taken on very human-like characteristics, particularly The Bear, who has a habit of gazing into your soul, making you feel stripped bare of everything you hold dear. It sounds unnerving, but totally relatable. Any cat owner can tell you, felines have a way of looking into the very core of who you are and what you represent. 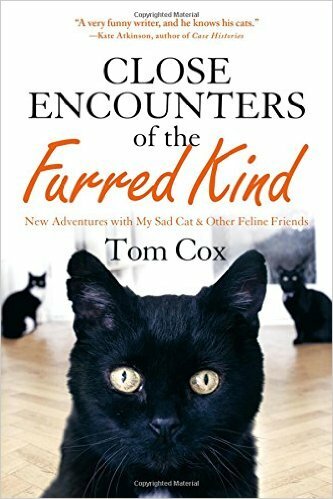 Tom Cox shares with us the journey he’s on with his pets, whether it’s relocating six hours away, or fending off the notable strays that cross his path, to falling in love with one of those strays, attempting to bring him into the fold. In telling his story, we’re reminded of the importance of having a pet in our lives. Combined with that, is the relationship Tom has with his parents, particularly his father, who is represented as a larger-than-life character, speaking primarily in ALL CAPS in nearly every sentence. I appreciate the honesty behind the realism of life with four cats, plus or minus one or two, if you count the strays. I also appreciate Tom’s self-deprecating humor. While he knows owning four cats isn’t everyone’s cup of tea, you end up yearning for the four he has. I loved reading about the way his cats live, the freedom they have to explore the great outdoors around them, the life I’d imagine most felines were meant to live. He wants the very best for his pets, because to him, they are family. I’d have to say, what I appreciated most this go around, having read The Good, The Bad, and the Furry (also a great read, reviewed here), is the emotion and sweetness we witness within and for each cat. They're not getting any younger, and that’s very much reflected in Close Encounters of the Furred Kind. There’s a big push to appreciate what you have even more, to cherish every moment you have, not only with your pets, but with your humans, too. Living life to the fullest every day, because none of us know what tomorrow will bring. Great review. I love books about cats.